Phoenix Pack receives many emails each day asking our help in saving dogs. Some requests are from our area, while others extend across the country. Once and awhile a remarkable plea for help comes, and on this occasion it came from the other side of the world – from turmoil-laden Kuwait. 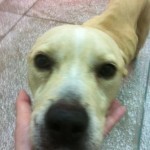 Yes Phoenix Pack has been contacted to save a pit bull terrier from the Middle East! Thanks to the support of many, we were able to bring Rico, a tortured pit bull terrier in Mexico, to St. Louis. Now we are asking your help again to help Gimpy and others like him. It was a typical November night in Kuwait, the weather still wonderfully warm during the day and pleasantly cool at nights. I was walking my dog Rosie, a rescued desert dog we have had a year now. We were about to finish with our walk, as always, passing the neighbor houses on the way back home. Suddenly Rosie wanted to sniff around the bushes at one of our neighbor houses and didn’t want to move on. I saw a pair of scared eyes looking back to me, and suddenly he showed up from behind the branches, a big, scary, aggressive, ready to tear me and my dog apart – pit bull!!! I was shocked!!!! But not because of being afraid but because of what I saw and was so abruptly was confronted with – an awfully thin, starved and dehydrated body of a pit bull, dragging one back leg and moving forward very slowly with his last strength and every step obviously causing him a terrible pain.. He didn’t even look at me as he was dragging himself towards me, slowly, as he was so weak and in horrible pain from the dislocated leg as I could see and he urinated while approaching me – he was afraid!! And still he felt that this was his last chance for survival! After what he has been through he certainly didn’t have a reason to trust humans, but he wanted to live… I was shocked by what I saw, that I just cried and cried.. Called my husband, drove the dog to the vet, found out that the displaced leg needs to be operated, named him Gimpy, drove back home and hoped for the best… Gimpy is approximately 4 years old boy, he has certainly been abused, most probably used for dog fights, and the dislocated leg may have been the reason he was thrown into the bushes in my neighborhood as he was of no use for a dog fight anymore. He had tried to eat branches and tree leaves for survival as our vet told us the next day. He looked so horrible that it was painful to look at him. It still is, but after few weeks of recovery, good food, care and love Gimpy is slowly getting back his strength, being the most sweet and calm dog in the hospital. Now, we truly hope that he will start using his injured leg again, as the nerves seem to be intact. Unfortunately he might have had the leg displaced too long time and the damage to the nerve could be permanent – in this case they will have to amputate the leg… Poor Gimpy! It seems to be a hopeless situation: we have a wrong breed in a wrong country and he might soon have only three legs! And still – we will try the impossible: to find a loving person who wants to give Gimpy a chance for a decent doggie life, and that in the U.S.It is well known that pit bulls are banned from many other countries like EU. To keep Gimpy here in Kuwaitand give for adoption will most probably end up him getting back into the hands of people who practice dog fighting and even though no good for fighting anymore, Gimpy could be used for “training” of other pit bulls. Before we will let that happen, we will try our best to find him a loving home in the U.S.Having two rescued dogs ourselves, we are at our limits and cannot keep Gimpy. However, we are gladly willing to cover all the expenses to get Gimpy healthy enough to travel and all the shots required. 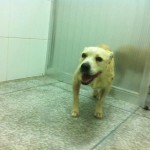 We also ship Gimpy to U.S. if suitable home could be found for him. What if after several months we still didn’t find anything for him abroad?? Me and my husband have to be realistic and make the decision then. We cannot keep Gimpy in the hospital forever, it is not a life for the dog nor can we financially support his stay there over a long period of time. But we definitely cannot give him here for adoption – shameful but true is that pit bulls in Kuwait are mostly used for dog fights, we do not wish for Gimpy to go through this ever again. 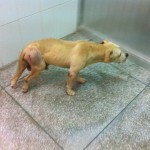 Animal rescue shelters in Kuwait will not take Gimpy, they are jam-packed with animals, sad stories and rescue cases. So why bother, why not just end the poor animal’s life right now?? – Few of you might ask! Look into Gimpy’s eyes, wouldn’t you want to give him a chance??? Gimpy wants the American Dream and we are going to give it to him! There is a lot of BSL in Europe and dog fighting is very prevalent in the Middle East, so to have the brightest future, Gimpy, like people everywhere, is coming to America. He will get the best vet care at The Pet Doctor and live in comfort with Phoenix Pack while we find him his forever home. Our ultimate goal is to raise $15,000 to build a cottage, as we did for Rico and Sugarbear. Then after Gimpy has found his forever home, that cottage will be used for other dogs in need. Phoenix Pack is grateful for all that our supporters do for us. An international rescue is certainly a challenge for a small rescue organization that relies solely on others for its existence, but how can we turn away from that wonderful faces like Gimpy’s? And how can we not help people who are willing to do so much for a dog they rescued from the street? Please support our dream of helping dogs in turmoil by clicking here to donate and continue to visit our website for updates to watch Gimpy’s American Dream come true!